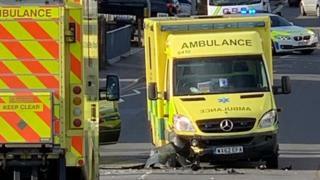 A car collided with an ambulance on its way to an emergency in Dorset shortly after police tried to pull it over. A man has been arrested on suspicion of drug-driving, dangerous driving and driving without insurance or a licence. Two paramedics were taken to hospital as a precaution after the crash in Fairmile Road, Christchurch, shortly after 14:30 GMT. The 31-year-old arrested man from Dorchester is also being held on suspicion of failing to stop. Officers said he suffered a minor injury and was treated at the scene. Before the collision an unmarked police car had illuminated its lights and requested the car - a Volkswagen Golf - to stop, Dorset Police said. Fairmile Road was closed near the junction of Clarendon Road for two hours to allow emergency services to deal with the incident. Anyone who witnessed the crash or any of the vehicles beforehand is urged to contact police.